Since I was at the Avenues Phase III anyway (H&M x The Weeknd), I figured I’d check out the Bath & Body Works on that side too. According to the Privileges App, B&BW were having this offer where you could purchase three items (Shower Gel, Body Lotion, Fine Fragrance Mist) for the price of two. Once again, in typical Bath & Body Works fashion, the offer was only applicable on select items (none of the newer collections), and would only last for the weekend. I didn’t want nor need anything, but since I rarely visit the Phase III branch, I figured I’d take a quick peek since I was there. I didn’t find anything interesting but like I’ve mentioned earlier, I’ve heard that Bath and Body Works are going to be pulling my beloved Dark Kiss from their Signature line. Dark Kiss is the one scent I purchase in each and every form available (Fine Fragrance Mist, Shower Gel, Body Lotion, Hand Soap, etc…) so even though I wasn’t sure how accurate that information was, I figured I’d stock up anyway, just in case. Pretty as a Peach Fine Fragrance Mist – Fresh. Juicy. Oh so pretty. Life’s never been peachier! I didn’t need any more lotions and getting anything else in the Dark Kiss range would’ve been overkill (I wanted to stock up and savor the scent, not make myself sick of it) so for the sake of variety, I decided to go with a Fine Fragrance Mist, even though they’re effectively useless (the scent lasts for about all 5 minutes on the skin before completely disappearing). Out of the meager selection of scents available, I went with Pretty as a Peach because it had a cute name, cute bottle, and smelled the nicest. Normally, I can’t stand the scent of peaches but in this scent, the nectarine was more apparent. Plus, mixed in with all the other notes, the overall scent was quite nice and fresh! 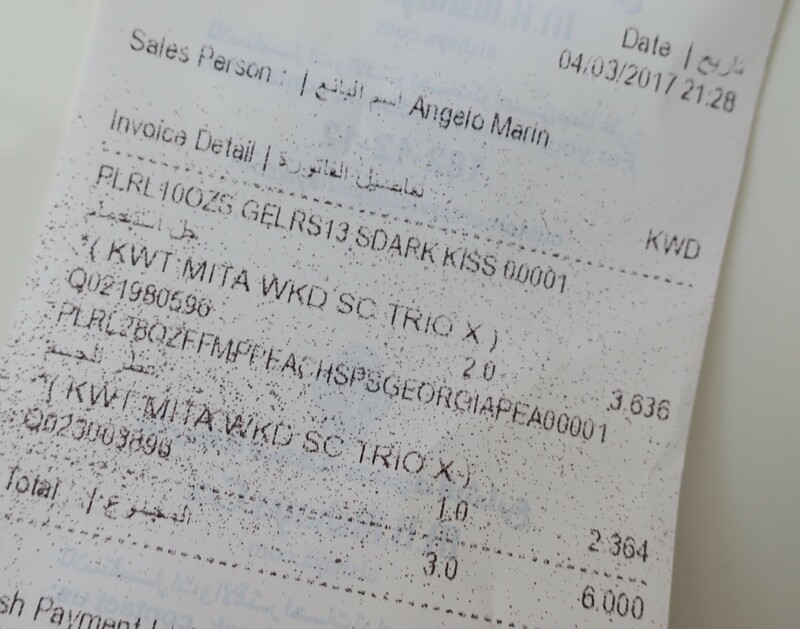 I’m not quite sure why the receipt is all speckled, but I payed a total of KD 6/000 for all three items, when I should’ve payed KD 16/500. So technically that really was a decent offer. Hope you enjoyed this post!